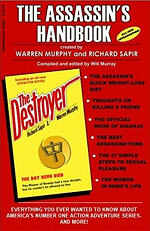 In 1982, Warren Murphy and Richard Sapir wrote "The Assassin's Handbook," a reader's guide to their long running Destroyer series of books. It was hailed as "oddball," "satiric," and a work of "unbridled weirdness." Over the years, the book became a collector's item. In December 2002, the book was returned to print by Warren Murphy's Ballybunnion Books. We are thrilled to be able to bring this much sought-after title into the digital age by making it available for the Amazon Kindle. The Assassin's Handbook also contains the novella by Sapir and Murphy entitled The Day Remo Died. A retelling of the beginning of the series, it provides a fresh new perspective into the early days of Remo and Chiun.